The Wicker Tree is just such a film. 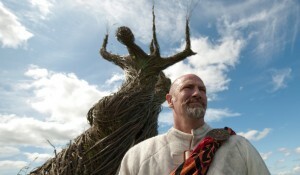 The Wicker Tree is a follow-up (though not a direct-sequel) to the original 1973 horror classic Wicker Man. In the original Wicker Man, devout christian Sgt. Howie (Edward Woodward) is lured to a remote Scottish village where, at the end of the film, he is sacrificed by the pagan Lord Summerisle (Christopher Lee). The 1973 Wicker Man (as opposed to the awful — if unintentionally humorous — remake that starred Nicolas Cage) is considered by many to be one of the best horror films ever made, a subtle and intelligent satire on organized religion, and a film that continues to provoke thought and discussion. The Wicker Man’s director, Robin Hardy, returns to write and direct The Wicker Tree and Christopher Lee has a brief (and pointless) cameo but otherwise, the Wicker Tree feels more like a companion piece to the heavy-handed remake than the original film. In The Wicker Tree, two “Texan” missionaries are sent to Scotland to preach to the heathens. I put “Texan” in quotation marks because — despite the fact that Hardy apparently spent a day shooting some location footage of Dallas for the start of the film — neither of the two characters come across as actual human beings but instead simply exist to confirm the stereotypical images and prejudices that many Europeans seem to have when it comes to Americans. (It’s not for nothing that this film was originally called Cowboys For Christ.) Beth (played by Britannia Nicol) is a Britney Spears-like singer who is looking to recreate her image through missionary work. Her boyfriend Steve (Henry Garrett) never takes off his cowboy hat. They both wear purity rings and … well, that’s about all there is to them. Once Beth and Steve reach Scotland, they meet the outwardly friendly Sir Lachlan Morrison (Graham Tarvish) who invites them to come to the small Scottish village of Tresscock to preach and take part in the local May Day celebration and…well, you can guess where this is heading. There’s really very little in this film that you can’t guess ahead of time. There’s a lot of reasons why The Wicker Tree doesn’t work as a film. The film’s predictable story plays out at an almost tortuously slow pace, Robin Hardy appears to have forgotten almost everything that he knew about directing in the 38 years between Wicker Man and this film, and there’s neither a sympathetic nor compelling character to be found in this entire mess. As for Graham McTarvish — well, let’s just say that he’s no Christopher Lee. One reason why Lee’s performance as Lord Summerisle in The Wicker Man is a classic of horror cinema is because Lee didn’t play the character as a villian but instead, as a pragmatist. It was obvious that Lord Summerisle didn’t believe a word he was saying but he was still willing to burn Edward Woodward’s Sgt. Howie alive because he knew that was what he had to do in order to keep the peace. Lee played up Summerisle’s ruthless intelligence and the end result was a thought-provoking film that forced the viewer to question everything that he or she had previously assumed. McTarvish, on the other hand, is much more obvious in his villainy and, as a result, the film is a lot less interesting. Ultimately, I think what’s wrong with the Wicker Tree can be summed up the stupid cowboy hat that Steve wears for almost the entire film. It’s such an obvious and predictable symbol of everything that Steve is supposed to represent and, as such, it’s a perfect symbol of the Wicker Tree as a film. The subtle wit of the first film has been jettisoned for something far more heavy-handed. Everything about it is obvious and predictable and, as a result, imminently forgettable. The original Wicker Man is a film that stays with the viewer. The Wicker Tree, however, fades into obscurity before your very eyes.